many sequels and even an RPG or four. adds some new moves, a plot of sorts, and great artwork. told. The built-in tutorial mode is also a nice touch. 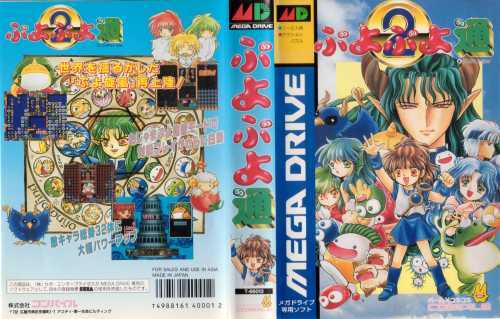 for Madou Monogatari, the RPG series in which she stars. These games have to rank as probably some of the best Puzzle games your going to get on the Genesis. A kind of combination between Columns and Tetris, you start with an empty pit, but slowly, various coloured beans/bubbles start falling from the top of the pit. It's your job to rotate these beans about and attempt to get 4 next to each other (not diagonally). Upon doing so, these beans will disappear and any beans above will fall down. I know what your thinking, 'wow thats exciting' - however, there's a twist. Each time you get rid of some of your coloured beans, some dreaded 'black beans' appear in your opponents pit. These nasties cannot be joined together by other beans, and so tend to block up the pit. You can however destroy them by getting rid of some ajoining coloured beans. This makes matches against both computer and human very intense, as each player trys desperately to empty their pit, only to see their pit fill up again with nasty black beans! You can get "chains" of bean combinations by making the same coloured beans fall on top of one another after getting rid of four. This sends a lot more black beans into the other persons pit, causing much shouting and frantic screams. There are three different game modes. Arcade, where you battle against computer opponents that get increasingly tougher, VS where you face off against another player and Exercise mode where you don't play against each other, but try to get the highest amount of points instead. A really REALLY addictive game, especially against another human opponent. Brilliant! This is the best puzzle game of all time. The unique 4 connect system and the awesome chain reactions make this stand out from the rest. 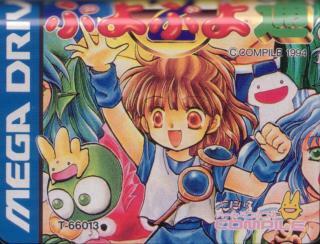 If you thought there were a lot of Tetris clones, there are also a lot of Puyo Puyo clones out there. 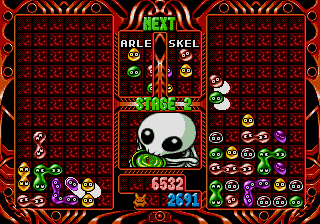 Puyo Puyo 2 is quite fun because you can cancel out the other player's attack by getting rid of your own pieces which makes the round last longer than the normal Puyo Puyo rounds. As for DRMBM, I never liked the show it was based off, so I seldom play it. 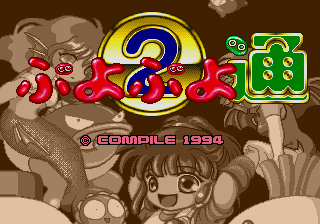 Puyo Puyo/DRMBM is a great game. Pure and simple. I just thank Sega for the usa/european Sonic branding otherwise it would have never had became as popular. It's a great puzzle game. Play it, it's as good as Tetris. This game is pretty cool. I'm not very good at it, but I like it. There is a story mode where you face enemies from the cartoon. They should have used the enemies from the video games in my opion. There is also a challenge mode to see how long you can go before you loose. Try that if you get really good! I can't get very far in it. There is also a two player mode which is tons of fun. Its almost like DR. Mario.. not much... In my opinon, in facing the charachters they should have usde the other Sonic Show! not this ABC kiddie one, i mean the Saturady Morning sonic the hedgehog Action one! know what i mean? PLEASE PAY ATTENTION this is the example of how to use a license correctly! I was so good at this game none of my friends would even stay in the room when i played..(nor would touch a control)!